For the Spanish military leader of the 17th century, see Gonzalo Fernández de Córdoba (1585–1645). Gonzalo Fernández de Córdoba (1 September 1453 – 2 December 1515) was a Spanish general and statesman who led successful military campaigns during the Conquest of Granada and the Italian Wars. His military victories and widespread popularity earned him the distinction of being called "El Gran Capitán" ("The Great Captain"). He also negotiated the final surrender of Granada and later served as Viceroy of Naples. Córdoba was a masterful military strategist and tactician. He was the first to introduce the successful use of firearms on the battlefield and he reorganized his infantry to include pikes and firearms in effective defensive and offensive formations. The changes implemented by Córdoba were instrumental in making the Spanish army a dominant force in Europe for more than a hundred years. Córdoba was born on 1 September 1453 at Montilla in the province of Córdoba. He was the younger son of Pedro Fernández de Córdoba, Count of Aguilar, and Elvira de Herrera, a member of the powerful Enríquez family. In 1455 when Gonzalo was two years old, his father died. His older brother, Alonso, inherited all of their father's estates, leaving Gonzalo to seek his own fortune. In 1467 Córdoba was first attached to the household of Alfonso, Prince of Asturias, the half-brother of King Henry IV of Castile. After Alfonso's death in 1468 Córdoba devoted himself to Alfonso's sister, Isabella of Castile. When King Henry IV died in 1474 Isabella proclaimed herself successor queen, disputing the right of Juana la Beltraneja (the king's 13-year-old daughter and her niece) to ascend the throne. During the ensuing civil war between the followers of Isabella and Juana, there was also conflict with Portugal since King Alfonso V of Portugal sided with his niece Juana. Córdoba fought for Isabella under Alonso de Cárdenas, grand master of the Order of Santiago. In 1479 he fought in the final battle against the Portuguese leading 120 lancers. Cárdenas praised him for his service. When the war ended Isabella and her husband Ferdinand were the rulers of Castile and Aragon. Once the Catholic Monarchs had consolidated their rule, they embarked in 1481 on a ten-year campaign to conquer Granada, the last remaining Muslim stronghold on the Iberian peninsula. Córdoba was an active participant in the fighting and distinguished himself as a brave and competent military leader. He gained renown for participation in the sieges of several walled towns including Loja, Tajara, Illora, and Montefrío. At Montefrío he was reported to be the first attacker over the walls. In 1492, Cordoba captured the city of Granada, bringing an end to the war. The skills of a military engineer and a guerilla fighter were equally useful. Because of his knowledge of Arabic and his familiarity with Boabdil, Córdoba was chosen as one of the officers to arrange the surrender. Córdoba was an important military commander during the Italian Wars, holding command twice and earning the name "The Great Captain". 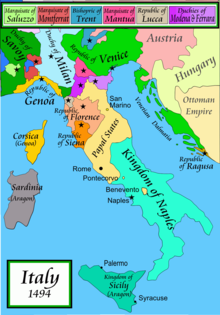 The Italian Wars began in 1494 when Charles VIII of France marched into Italy with 25,000 men to make good his claim to the Kingdom of Naples ruled by Ferdinand II, a cousin to Ferdinand of Aragon. The French easily overwhelmed the Neapolitan defenses and on 12 May 1495 Charles had himself crowned Emperor of Naples. The Catholic Monarchs were anxious to reverse French success in Naples and selected Cordoba to lead an expeditionary force against Charles. Cordoba landed in Naples shortly after Charles' coronation with a force of about 5,000 infantry and 600 light cavalry. Fearful of being trapped in Italy, Charles installed Gilbert de Bourbon as Viceroy of Naples and returned to France with about half of the French forces. Initially, Cordoba's light infantry and cavalry were no match against the heavily-armed French. A lack of training and poor coordination between Spanish and Italian forces compounded the problem. In their first major engagement on 28 June 1495, Cordoba was defeated at the Battle of Seminara against French forces led by Bernard Stewart d'Aubigny. After the defeat, Cordoba withdrew to implement a rigorous training program and reorganize his army. The Spanish employed effective guerrilla tactics, striking quickly to disrupt French supply lines and avoiding large-scale battles. Gradually Cordoba regained a foothold in the country and then assaulted the French-occupied Italian cities. Within a year, Cordoba achieved a decisive victory at Atella, capturing the French viceroy and expelling the remaining French forces from Naples. He also recovered the Roman port of Ostia and returned the captured territories to the Italians by 1498. When Cordoba returned to Spain he drew on the lessons from the Italian campaign to restructure the Spanish forces and military strategy. In the open field, the loose formation and short swords of the Spanish infantry were unable to withstand a charge of heavy cavalry and infantry armed with pikes. To overcome this weakness, Cordoba introduced a new infantry formation armed with pikes and a heavy, shoulder-fired gun call an arquebus. To increase tactical flexibility he assigned different sections of his forces with specific roles, rather than using them as one general force. These new sections could maneuver more independently and act with greater flexibility. After Louis XII succeeded Charles as king of France in 1498, he quickly declared his intention to re-invade Italy and once again seize Naples. To buy time, Spain negotiated the Treaty of Granada with France in 1500, agreeing to partition Naples between the two countries. Cordoba returned to Italy leading a large force on the pretext of joining with France and Venice to attack the Ottomans in the Ionian Sea. For a time Cordoba did fight the Turks, seizing the strongly held island of Cephalonia in December 1500 after a two-month siege. Cordoba returned to Naples and after Frederick IV abdicated, the French and Spanish fought a guerilla war while negotiating the partition of the kingdom. Spain was outnumbered and besieged in Barletta by the French. Córdoba refused to be drawn into a full-scale battle until he received sufficient reinforcements. When his army was adequately reinforced, Cordoba engaged the French on 28 April 1503 at the Battle of Cerignola where 6,000 Spanish troops faced a French army of 10,000. Córdoba formed his infantry into units called coronelías with pikemen tightly packed in the center and arquebusiers and swordsmen on the flanks. The French unsuccessfully attacked the front and were assailed by gunfire coming from the flanks. The French commander, the Duke of Nemours, was killed early in the battle. After withstanding two French charges, Cordoba went on the offensive and drove The French off the field. This was the first time in history that a battle had been won largely through the strength of firearms. Cordoba occupied the city of Naples and pushed the French forces back across the Garigliano River. Separated by the river, a stalemate ensued with neither side able to make progress. But Cordoba strung together a pontoon bridge and stole across the river on the night of December 29, 1503. The French, commanded by Ludovico II of Saluzzo, had assumed the rain-swollen river was impassable and were taken by complete surprise. Cordoba and his army decisively defeated the French with their formations of pikes and arquebuses. Cordoba continued to pursue the French and captured the Italian city of Gaeta in January 1504. Unable to mount a defense after these losses, the French were allowed to evacuate Italy by sea and forced to sign the Treaty of Blois in 1505, relinquishing their hold on Naples. When the French were driven out of Naples, Córdoba was made Duke of Terranova and appointed Viceroy of Naples in 1504. Later that same year Queen Isabel I of Castile died, depriving Córdoba of his most ardent supporter. Isabel's death also effectively pushed her husband, Ferdinand II of Aragon, out of power temporarily in Castile and forced him to defend his interests in Aragon. Naples was an Aragonese kingdom but Córdoba was a Castilean and widely popular. As a result, Ferdinand suspected his loyalty and also felt that Córdoba spent too freely from the treasury. In 1507 Ferdinand traveled to Naples, removed him from office and ordered him to return to Spain with a promise that he would be installed as master of the Order of Santiago, a powerful and prestigious position. Although Córdoba was awarded the additional title, Duke of Sessa, he never received the promised appointment to lead the Santiago military order. Ferdinand continued to praise Córdoba but gave him nothing else to do; Córdoba eventually retired to one of his country estates. Gonzalo Fernández de Córdoba died of malaria on 2 December 1515 at his villa near Granada at age 62. Córdoba first married in 1474 to his cousin Maria de Sotomayor; about a year later she died giving birth to a stillborn son. On 14 February 1489 Córdoba married Maria Manrique de Lara from a powerful and wealthy noble family. His only surviving daughter, Elvira Fernández de Córdoba y Manrique, would inherit all his titles upon his death in 1515. Córdoba was a pioneer of modern warfare. He revolutionized sixteenth-century military strategy by integrating firearms into the Spanish infantry and directed the first battle in history won by gunpowder small arms (the Battle of Cerignola). He helped found the first modern standing army (the nearly invincible Spanish infantry which dominated European battlefields for most of the 16th and 17th centuries). Córdoba's extensive knowledge was passed on to the next generation through the men who served under him. He left no sons, and was succeeded in his dukedoms by daughter Elvira Fernández de Córdoba y Manrique. Córdoba's burial place, the Monastery of San Jerónimo in Granada, was built in Renaissance style by his wife and daughter. It was desecrated by Napoleonic troops under the Corsican General Sebastiani at the beginning of the 19th century. Stone from the tower was used to build the Puente Verde bridge over the Genil. The monastery was fully restored at the end of the 19th century. Downey, Kirstin (2014). Isabella : the warrior queen. New York: Nan A. Talese/Doubleday. ISBN 9780385534116. Gerli, E. Michael (2003). "Fernández de Córdoba, Gonzalo". Medieval Iberia: An Encyclopedia. Routledge. Lanning, Michael Lee (2002). The Military 100: A Ranking of the Most Influential Military Leaders of All Time. Citadel Press. Lynch, John (1981). Spain Under the Hapsburgs, Volume One (2nd ed.). New York University Press. Purcell, Mary (1962). The Great Captain: Gonzalo Fernández de Córdoba. Garden City, N.Y.: Doubleday. Rubin, Nancy (1991). Isabella of Castile: The First Renaissance Queen. St. Martin's Press. Tucker, Spencer C. (2015). "Córdoba, Gonzalo Fernández, Conde de (1453-1515)". 500 Great Military Leaders. 1. ABC-CLIO. pp. 170–172. 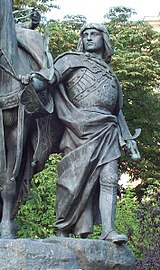 "Gonzalo Fernandez de Cordoba". Encyclopedia of World Biography. GALE. 2000. This page was last edited on 2 January 2019, at 23:10 (UTC).